It’s no secret that Jump Force is launching at the end of this week, February 15th for player’s of PS4, Xbox One and for PC! To give you some details, that many of you for sure are waiting for, we want to share with you a full list with Characters that will be available in the base game. But be aware, there will be some more characters available if you purchase the Jump Forse Character Pass for $30. Then you will receive 9 more new characters! 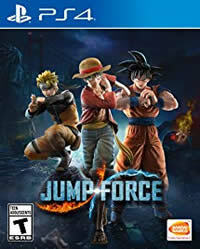 You don't know what kind of game Jump Force is?Jump Force is a third person fighting game which is characterized by putting super popular characters of different Shonen Jump franchises against each other. Spike Chunsoft is responsible for the development and Jump Force is published by Bandai Namco. We all expect a great start of the game because there have been many Betas in the past. There will be huge amount of 40 characters on launch and 9 more characters that will be released later. The characters are polular and e.g. known for Dragon Ball, Naruto, Bleach, My Hero Academia and of course many others. Want to check out the character? Take a look at the list below! Did you already choose your favourite character? What are your thoughts about the complete collection? Use the comments below!